Most people with a few pet rats don’t have any problem housing them. An attractive cage (or two) on a table in the living room or bedroom and everyone is happy. There does come a point, however, where the casual pet owner finds themselves becoming a fancier and becomes involved in breeding and showing. The subsequent increase in furry friends often necessitates a close look at where and how they are housed. This is in no way to imply that all serious fanciers have huge numbers of animals. Nothing could be further from the truth and in actuality, many of the most successful fanciers have small populations of 15–25 animals. It is these serious fanciers with small colonies (and those folks headed in this direction) that this article is for. I will say, however, that the general principals are true whether you own two or two hundred rats and mice. 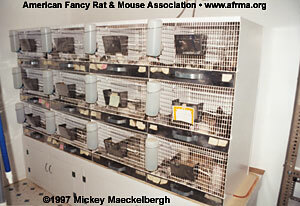 Above: a compact 12-unit cage which can house several rats in a small area of your house. Photo by Mickey Maeckelbergh. As pointed out before, the pet owner with a couple of rats usually finds it simple to house them. When the numbers increase though, some thought to their housing can make their care much simpler, and can make them much more enjoyable pets. When numbers dictate accommodating more than a couple cages of rats and mice, their needs change as well. More food and bedding has to be stored and yet kept easily accessible. The cages will take up a large amount of physical space, and yet for ease of care they should be in close proximity to each other. Often, fanciers like to increase cage size instead of number, and once again space becomes a factor. Naturally more cages will create more mess (bedding, bedding everywhere) and even if kept spotlessly clean, they will produce some odor. The primary focus of the fancier who owns a small colony should be to adequately provide for their animals’ needs while minimizing the time and energy they must put into daily chores such as cleaning, feeding, and watering. Every minute saved doing chores is a minute gained for playing with and enjoying your pets. This is an extremely important decision, and one upon which all other care decisions must be based. Let’s face it, a cage or two on the coffee table are enjoyable, 8 or 10 on your living room floor, in bookcases, spilling over into the kitchen, and a few in the bedrooms and bathrooms as well, can start to become problematic. When most fanciers find their cages increasing in number of size, they can find themselves overwhelmed. The key to preventing this is to centralize all your cages and keep your number of animals in check (a good subject for another article). This is when most fanciers start thinking about the necessity for a true Rattery or Mousery just for the critters. Depending on the space available and the individual fancier’s interest and finances, there are two good solutions with numerous variations. Many fanciers find their space and finances limited. While their rats and/or mice are an enjoyable hobby, they are unwilling or unable to devote a large chunk of funds or space to them. After all, one of the primary reasons many of us got the little critters in the first place is because they don’t take up much room. 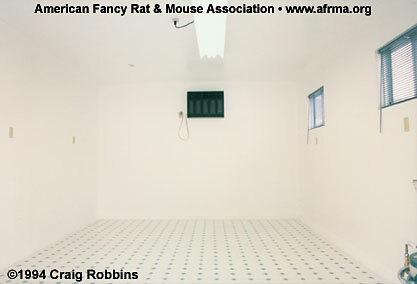 This rodent room (12' X 20') was built as an attached room to the garage. It has high gloss paint on the walls, vinyl flooring, an air conditioner, a sink just out of the picture, two small windows to let in fresh air, and a large shop light to illuminate the entire room. Photos by Craig Robbins. Add a few roll-around racks that are easily moved to clean around them or to change the layout of the room, and you just need some animals and cages and you’re in business. For these folks, the solution is to set aside a small area in their homes specifically for the rats/mice. Ideally, this does not include the main body of the house. Living rooms, kitchens, and dining rooms are not usually good choices, though all have been the ideal choice in some cases. The best place is an otherwise unused part of the house or apartment. Spare bedrooms, part of an office, a basement, or even an unused laundry room are all perfect. If you have other animals like dogs or cats, it becomes doubly important to be able to exclude them from this area. In parts of the country with very mild weather, part of a garage will work. Just be careful of how warm and cold your animals get and make sure wild rodents won’t be a problem. The fun thing about having a rodent room is that you can have a great time decorating. This is your chance to fill the walls with rat and mouse related pictures, photos, and other great “stuff.” You also can display all your ribbons and trophies collected at shows. Better yet, a rodent room allows you to keep all your critters where you can play with and enjoy them any time you have a moment. Rodent rooms have a downside as well (naturally). They tend to take up a large chunk of YOUR living space that you may want to put to some other use. There also can be a smell associated with keeping a number of animals (particularly male mice) even if their cages are kept very clean. In addition, some bedding will escape from those cages no matter how hard you try to contain it. This will get tracked throughout the house very quickly. Those folks that own other furry friends of the large predatory kind may find it impossible for both species to cohabitate under the same roof. Finally, there is the danger of having a potential escapee. A loose rat or mouse can do a great deal of damage to wiring, carpets, wallpaper, and furniture in a very short time. This rodent shed is a 10' X 12' size and was built on a concrete slab. These sheds are available in kits from large do-it-yourself home improvement centers or you can have them custom built from companies that make sheds to your specifications. 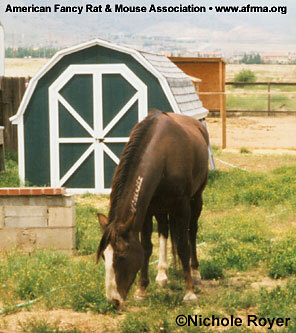 (Horse not included when you purchase a shed.) Photos by Nichole Royer. 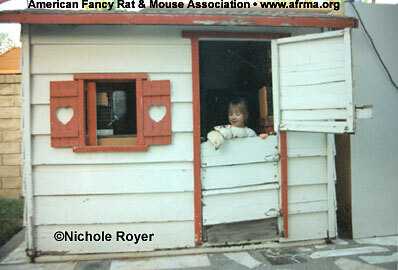 This was a child’s play house that was converted to a rodent house. This has its own wooden floor but is on a slate patio slab for extra protection from dirt and bugs. 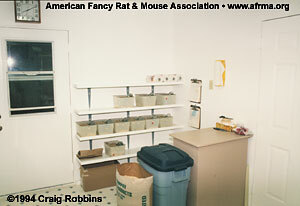 For some folks, setting aside a whole room in their house for their rats and mice is impractical. Many simply don’t have the space, while others object to the mess or smell (or family members do). For those folks, there is a very simple and practical solution . . . build the rats and mice their own house. This does not necessarily mean constructing a mansion for your critters, though if you have the funds and the desire I’m sure they would be delighted. Instead, for most folks, it means constructing a simple shed in their yard. Though you can create one from scratch, there are many highly satisfactory kits available at reasonable prices. Some companies will even assemble them for you at an additional fee. These buildings range from small aluminum structures, to fiberglass, to complete wood buildings. For those with the desire, it can even involve building a house or garage extension which includes indoor plumbing, and centralized heat/air conditioning. When thinking about a rodent house, it is very important to look at your needs, both current and future, before beginning. Sheds can commonly be found as small as 5 feet X 8 feet, and as large as 10' X 20'. Cost is, of course, correspondingly more for the larger buildings. It isn’t necessary to spend a fortune on this venture, however. Even something as simple as an old child’s play house that the kids have outgrown can work very well. Often, used sheds can be found in the Penny Saver and classified ads. Once you know what you want, you need a place to locate it in your yard. Remember, you will have to go out and see your critters even in the worst weather Mother Nature dishes out. You also need to be sure that you can run electricity to your shed (believe me, it’s a must). This can be done simply, though it’s best to check with a knowledgeable person about electrical safety first. Erecting the building is just the first step. Once again, only your imagination and budget will hold you back. At the bare minimum, your shed needs to be water tight and keep your critters safe from the elements. Depending on the weather in your area you may need to insulate, heat, and or air-condition it. A window (with a screen) is a very nice feature for ventilation, and an electric light of some kind is essential. Your shed also needs to be safe from predators and wild rodents. Once you have the basics (a climate controlled box), the rest is up to you. Floors can be linoleum, cement, or any other surface that is easily cleaned. The walls can be bare, paneled, or painted (just be sure the rats cannot reach any insulation). Decorations are up to you and it’s always fun to go to town. Pictures, ribbons, and other related decorations make your rat house truly your own. Rodent houses are great, and have lots of benefits. They are isolated from your own dwelling so any mess or smell will not be a problem. They also add to the space available and eliminate having to give up your own house space for the critters. They can be securely latched so that the small furry friends can be protected from attention by any resident large furry carnivores. Food and bedding can be stored within for ease of access, as can spare cages and other supplies. When cleaning and general care takes place, everything needed is all centrally located so chores can be completed with a minimum of time and effort. Naturally, rodent houses have their disadvantages as well. That trek out to feed and water can be a cold damp one in the rain or snow. Because your critters are not inside your own home, you lose the ability to play with them at any given moment, and you also are not able to observe their behavior as frequently. Cost of construction is also a big factor, as well as heating and air conditioning bills. Despite the negatives, however, many fanciers find a rodent house the only practical way to house a large number of our furry friends. 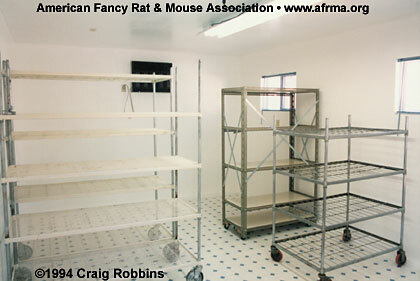 Go to part 2: Adding cages and critters to your rodent room or shed.